Skimm founders Carly Zakin and Danielle Weisberg, who have been filtering the daily news cycle through The Skimm’s signature “of course none of us actually care, but here’s how to seem less dumb” packaging for five years now, came under new scrutiny in the Trump era. Although The Skimm’s 6 million subscribers and 50-person team indicate that there’s a not-insignificant appetite for this aggressively apolitical tone, the news is so insidious right now that it’s jarring—for some of us, at least—to see it contorted into nihilistically cheerful mini paragraphs, which take pains to frame the issue of the day within digestible concepts like rosé and “vacay” and squad goals and, ugh, being late for brunch! “Its patronizing tone assumes that female news consumers tune out anything of import if it’s not processed through verbal eye-rolls,” Christina Cauterucci wrote for Slate in May, drawing comparisons between the newsletter and Ivanka Trump. 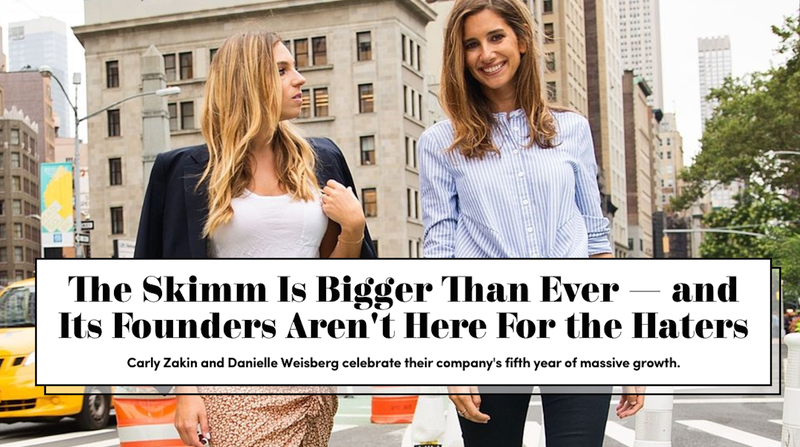 It’s arguably the first less-than-glowing press Carly Zakin and Danielle Weisberg, co-founders of The Skimm, have received in its five years, a response to the vocal-fried, sarcastic voice of their daily newsletter and news app marketed toward women (though 20 percent of their subscribers are men). Their May 17 “Repeat After Me” column — “What to say when your friend asks what time you can get drinks after work... ‘I’ll be free earlier than expected. Just like Chelsea Manning. Today, the soldier is getting released from military prison…more than 20 years early.’” — had been the last straw for leftist Twitter, which called the reference flip and inappropriate, inciting the bad press. Hm—what could have possibly, possibly happened here? Cosmopolitan is by no means the first publication to covertly rewrite stories, sometimes known as “stealth editing”; the New York Times has found itself in hot water for a similar practice, while BuzzFeed purged thousands of posts in 2014 without any initial acknowledgment. Taking a story down and republishing without acknowledgment is not common practice, however, particularly when the new version is more sympathetic to the article’s subject. According to (both versions of) the Cosmopolitan article, the founders did a “total analytics deep dive” following the wave of criticism and found that most of the negative posts came from “people who worked in media and produced things that we might read, but the majority of our audience does not.” In other words, according to its Carly and Danielle: members of the media might hate TheSkimm, but it doesn’t matter, because not only is their audience not the media, their audience, to a large extent, has no use for actual articles. Another interesting point—this one was cut—noted that The Skimm’s founders perceive their newsletter’s popularity as the result of a kind of backlash to an overly-partisan media landscape. “News feels distant to young Americans, Carly argues, because, in an effort to be more engaging, media coverage has gotten emotional,” the original version read. That may be true, but perkily stating facts without contextualizing their significance doesn’t seem like a solution for ignorance so much as total capitulation to it. Neither does rewriting articles to be gentler on a subject. Am I right, ladies?